DFID (British Development Help) have funded numerous initiatives on the arsenic issue. These include a two phased approach by DPHE / British Geological Survey (BGS) / Mott MacDonald Ltd. 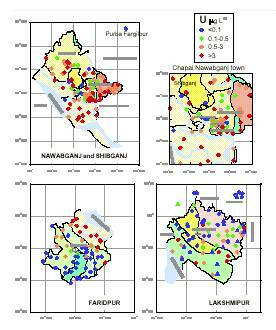 Phase one included the compilation review and database of existing groundwater and sediment arsenic data from Bangladesh; a systematic groundwater quality survey using laboratory analysis for the 41 districts then believed to be worst affected in Bangladesh; a detailed geochemical investigation in three special study areas; modelling the movement of groundwater and arsenic in a typical Bangladesh situation. Phase two continued from Phase one and extended the survey to the remaining districts of Bangladesh excluding the three districts of the Chittagong Hill Tracts. Pyrite oxidation: In response to pumping, air or water with dissolved oxygen penetrates into the ground, leading to decomposition of the sulphide minerals and release of arsenic. Oxyhydroxide reduction: Arsenic was naturally transported in the river systems of Bangladesh adsorbed onto fine-grained iron or manganese oxyhydroxides. These were deposited in flood plains and buried in the sedimentary column. Due to the strongly reducing conditions which developed in the sediments and groundwater of certain parts of Bangladesh the arsenic was released into groundwater. The release mechanism is still hotly debated but the second theory is thought to be the more likely explanation. 1) Arsenic is released by oxidation of arsenic-bearing pyrite in the alluvial sediments (Mallick and Rajagopal 1996; Mandal et al. 1998). 2) Arsenic anions sorbed to aquifer minerals are displaced into solution by competitive exchange of phosphate anions sourced from over-application of fertilizer to surface soils (Acharyya et al. 2000). 3) Naturally-occurring arsenic that is sorbed to iron oxyhydroxides (FeOOH) is released when the iron oxyhydroxide is reduced as anoxic conditions develop during sediment burial (Bhattacharya et al. 1997; Nickson et al. 1998, 2000; McArthur et al. 2001). The development of strongly reducing conditions is believed to be the trigger that has been responsible for the release of naturally-occurring arsenic from the sediment into the groundwater. This arises from the rapid consumption of dissolved oxygen by the oxidation of fresh organic matter in the recently-buried sediments. Once strongly reducing conditions are achieved, arsenic is released from the sediments. The mechanism for this release is poorly understood quantitatively but is believed to involve the desorption from, and dissolution of, arsenic from various oxides, especially iron oxides. sensitive to redox conditions(BGS, DPHE 2001). "In spite the detailed mapping and review of arsenic occurrence and regional geology, no conclusion can be drawn regarding geographical source of arsenic"
This is a small part of a big "iceberg". Unfortunately there is any standard to arsenic in fertilizer. Cadmium allowable standard for cadmium is under 0.12 mg/kg. Arsenic is carcinogen. If we take the standard for cadmium, we are using fertilizers that contain about 30, 000 times higher toxic arsenic to our ground water. The Department of Agriculture should come forward to safe guard public health and made quantitative analysis of fertilizer all over Bangladesh. Among them nitrogen and phosphorus are the major nutrients of concern that are frequently applied in our crop field in Bangladesh. Contamination of water: Heavy rain or irrigation following nitrogen application causes runoff and leaching of widely used nitrogen fertilizer compounds. The source of soluble nitrogen in soil water are humus (37%), human and animal manure (22%), fixation by soil bacteria and algae (18%), rainfall (9%) and 13 percent may come from fertilizer added to soils. So, soils heavily fertilized above levels recommended are potential source of nitrate contamination in ground or runoff water. Phosphorus fertilizers are partly responsible in increase of water contamination. The major source of phosphorus contamination in surface water comes from direct damping of wastes and from eroded suspended solids from urban and agricultural land. About 21 per cant of total phosphorus supply in water may come from fertilized land. Leaching of nitrate, volatilization of ammonia, sediments and dissolved other fertilizer chemicals in runoff are all diffuse sources of pollution. Increased intake of fertilizers is continuously putting additional poisonous ingredients into the soil and causing serious pollution problem (M. R. Islam, 2001). In other words high phosphate concentration can be correlated with high arsenic but high arsenic cannot be correlated with high iron. There are many wells that contain high arsenic but low in iron (Anwar, 2000). The general conclusions from the sediment studies are that the sediments are typical of alluvial and deltaic sediments with normal amounts of arsenic, mainly in the 1-10 mg kg -1 range for total arsenic. However, even normal amounts of arsenic are sufficient to give excessive arsenic in the groundwater if dissolved or desorbed in sufficient quantity. In the 21 samples studied in detail, the average total arsenic concentration was 4 mg kg -1 and ranged from 0.4 mg kg -1 to 10 mg kg -1 . Arsenic concentrations were greatest in the fine-grained sediments Scanning electron microscopy (SEM) showed the sediments were in all respects typical alluvial and deltaic sediments The general conclusions from the sediment studies are that the sediments are typical of alluvial and deltaic sediments with normal amounts of arsenic, mainly in the 1-10 mg kg -1 range for total arsenic. Everything points to the arsenic being of natural origin although it is not yet possible to exclude the possibility that modern agricultural practices (ground-water abstraction from shallow wells, irrigation and fertilization) will have no influence on the groundwater arsenic concentrations . However, even normal amounts of arsenic are sufficient to give excessive arsenic in the groundwater if dissolved or desorbed in sufficient quantity (BGS, Final Report, 2000). The BGS et. al (2001) further adds: phosphorus enrichment parallels the distribution of arsenic enrichment and is concentrated mostly in northeast and southeast Bangladesh." The average arsenic concentration in earth crust is 2 ppm but it can be much more concentrated in arsenic-containing ores such as arsenopyrite (FeAsS) or orpiment (As4S6). Concentrations as high as 20000 ppm can be found in these materials. In soils, there is important differences in concentration values mainly due to the nature of the rock present in the soil. Concentrations as high as 8000 ppm have been reported. In water, the arsenic occurrence is linked to the nature of soil and rock. For instance in a gold mining water, the concentration can reach 1g (1000mg)/L but in sea water the concentration is between 2 and 14 ppb. Most of studies have reported high concentrations in some well water (1 ppm) due again to the presence of rich arsenic rock close to the groundwater. The counties affected have a combined population of more than 2 million people. Most of the affected wells are completed in the Marshall Sandstone, the principal bedrock aquifer in the region. Nine counties in eastern and southeastern Michigan are participating with the USGS in a collaborative study of domestic wells that exceed the EPA drinking water standard for arsenic (50 µg/L.Preliminary geochemical modeling confirms that pyrite is stable at depth in unoxidized Marshall ground water. This indicates that oxidation occurs elsewhere, perhaps in overlying glacial aquifers containing till derived from the Marshall. Electron microprobe/SEM studies of the sandstones show that pyrite locally forms pore-filling cement and/or fossil replacements, in which arsenic-poor framboids or framboid masses are succeeded by arsenic-rich (up to 6.5 wt. percent) overgrowths. . The vertical distribution of arsenic indicates that oxidation occurred near the top of the aquifer, perhaps due to fluctuations of the water table. Alternatively, oxidation of till containing detrital Marshall Sandstone could contribute arsenic to glacial aquifers that directly overlie the sampled intervals. The amount of pyrite in the Marshall Sandstone and its arsenic concentrations are sufficient to explain the anomalous arsenic in groundwater. Analysis of rock digests yielded arsenic concen-trations up to 60 mg/kg in these pegmatites, with much lower values in the parent granite, and associated schists. Weak acid leaches show that approximately half of the total arsenic in the pegmatites is labile and therefore can be mobilized during rock-water interaction. SEM/EDS analysis of the pegmatites shows the predominant arsenic phase to be arsenopyrite, with secondary scorodite reaction rims. Arsenic concentrations measured in water samples from local bedrock wells range from 2 to 453 µg/l. There is no evidence for the weathering and deposition of a discrete set of arsenic-rich sediments at some particular time in the past (BGS, 1998). Now we are adding arsenic 10- 30 mg/kg arsenic to soil two to three times a year (2-3 crops, mainly rice) and since more than two decades. Rice is cultivated under clogged water, which in turn makes reducing environment within a few centimetres from the top soil and ultimately desorbed arsenic transfers directly to ground water. The sample collected is from Kanipur market, Faridpur. There is also very high amount of uranium (TSP, Calgary 200 mg/Kg). So Uranium is added to ground water several thousands times than allowable standard. According to BGS (UK) there are many wells that contains a dangerous amount of Uranium. But these wells are not made to public. Uranium is more dangerous and hazardous to health than arsenic. One element of potential health concern high-lighted by the analytical data was uranium. This has been assigned a provisional guideline value of 2 µg L -1 (For uranium: 1 µg = 0.72 pCi.) by WHO. ·28% of the samples from the three Special Study Areas. The maximum uranium concentration observed was 47 µg L -1 from the Chapai Nawabganj, one of the worst arsenic affected areas of Bangladesh. The present industrial or agricultural policy ignores environmental protection, as a result a technology transfer of polluted industries and chemically based agriculture from the first world is imported into the developing countries. To make the best use of fertilisers, scientists concentrated on breeding crop varieties, which responded well to the application of large quantities of artificial fertiliser, such varieties are costly to develop, and they tend to be patented so that the company could protect its interests. The agrochemical industry has used lucrative research contracts and grants to establish close links with training colleges, universities and research institutes. With funding comes control over the specific content of research projects. The European Environmental Bureau pointed out in a conference held in December 1987, the EC has safe disposal facilities for only 10 million tonnes of hazardous waste per year, or one-third of the total generated. Twenty million tonnes of hazardous waste per year will be looking for a resting-place. A number of European or North American business or municipal authorities have sought to transport toxic wastes to certain Third World nations with little or no consideration of the possible consequences for local population. The cost of transporting toxic wastes to developing countries is only a fraction of the cost of safely incinerating or storing them in the in the West and meeting government regulations in doing so In Bangladesh exists either knowledge on hazardous waste or laboratory facilities to analyse chemicals or substances that pose threat to human life and nature. The World Bank invested 20 per cent of its total investment the agricultural development in Bangladesh since 1973. Being one sincere advocate of Green Revolution that introduced hybrid seeds supported by chemical fertiliser and pesticides World Bank in Bangladesh also continues to grant credit for many projects designed to promote and sustain Green Revolution. The World Bank (ADB, sister organisation of World Bank) has designed forestry projects, which tend to put emphasis monoculture even in the mangroves in Bangladesh (Raj and Gain, 1997). The food grain production in Bangladesh has been increased for which bringing more lands under food-grain cultivation worked as a major factor (Dhaka Courier, 17 October, 1997). In spite of introduction of "Green Revolution" half of Bangladesh's population still reside under poverty line in regard to their ability to secure their food. This was revealed in a joint study called "Sustainable Food Security in Bangladesh" by Government of Bangladesh, UNDP and FAO. The study further found out that 25 percent of population live under extreme poverty line, 5 percent of which i.e. about 6.5 million people are "poorest among the poor" whose daily meal is always uncertain. Agriculture in Bangladesh is directly supported by the chemical fertiliser production for which the World Bank has granted loan for several projects. So far the World Bank has granted credit directly for fertiliser production, import, transportation and fertiliser industry rehabilitation. The total World Bank credit allocation for this sector, within 1973 to February 1996 is US $ 166 million. The World Bank works with the objective to promote private sector investment in agriculture and advises the government of Bangladesh to undertake policies accordingly. The Bank conducted studies between 1987-89 and identified constraints to the promotion of private investment in agriculture. It made suggestions to Bangladesh Government on how to make way for the private investment mainly for distribution of irrigation, equipment and import fertiliser and seeds which will enable the multinational corporate to spread the agric-business more in Bangladesh market (Dhaka Courier, 17 October, 1997). Subsequently, the government developed irrigation based agricultural strategy. These were policy reform projects towards private investment promotion - shallow tube well, and low lifts pump irrigation project completed in 1995 and National Irrigation Development Project in 1998. Accordingly, the Government of Bangladesh privatised the fertiliser distribution entirely in 1989-90. About 40% of the fertiliser in Bangladesh is washed into the riverine and ground water systems (Safiullah and Mafizuddin, 1988). A recent study shows that a high concentration of ammonia (NH4) and nitrate (N03) occur in the samples from shallow and deep tube wells (Hossain, 1997). The chemical fertilisers directly support agriculture, pesticides for which the World Bank has granted loan for several projects (the total credit for this sector from 1973 to February 1996 is US dollars 166 million). The growth rates of total rice production (the hero of our green revolution - HYV Boro) seems to have gone down and acreage during the last four years show a distinct downward move compared to the preceding period and to the decade's average trend (Bayes, 1995). According to a study by BRAC (Bangladesh Agricultural Research Corporation) 70 percent of Bangladesh total arable land has reached the critical level or has gone even below (BARC, 1993 study). Although the World Bank views that the damage has been caused by the "incorrect fertiliser application" (Dhaka Courier, Oct. 17, 1997). FAO reveals that land degradation costs South Asian states 10 billion US dollars a year due to damage in vital agricultural land that underpin food production: Afghanistan (33%), Bangladesh (75%), Bhutan (10%), India (25%), Iran (94%), Nepal (26%), Pakistan (61%), and Sri Lanka (44%) (Daily Star, 9. 3. 95). The remarkable expansion of chemical fertiliser in the region has caused serious depletion essential plant nutrients. It has been appeared many areas in Bangladesh serious soil nutrient "mining" process and consequent decrease in yields. Fertilisers invented in the North (temperate climate) behave differently in tropical soils - many natural transformations are impossible to reproduce under existing laboratory or experimental studies. Now in Bangladesh 60 % of the arable lands have organic matter much below critical level (1.5 percent) and the rate of depletion is alarming. Over million hectare of arable land has been identifies as sulphur (S) deficient and two million hectare land has zinc (Zn) deficiency (Rahman, 1996). After nineteen seventy's many of the changes in our agriculture have been made possible through commendable technological advances such as, by using modern varieties of fertilizers and pesticides which result in the increase of agricultural production. On the contrary, the accelerating pace of such unconstrained technological application has already become a threat to our environment. Environment refers to the air we breathe, the water we drink and the food we take to sustain ourselves. Some of the fertilizer chemicals have adverse impact on such life supporting resources in environment. Among them nitrogen and phosphorus are the major nutrients of concern that are frequently applied in our crop field. In fact, crops are not enough efficient to use these and consequently a greater proportion of the chemicals is lost and/or some undesirable toxic substances are released in the soil, water and gaseous systems. Inappropriate use of fertilizer chemicals aggravates the problem resulting in deterioration of soil, water and food quality and in gaseous imbalance in the atmosphere. Therefore, fertilizer management in the crop field is the crucial issue for maintaining the quality of our life-supporting resources to meet the demand of the future generation (M. R. Islam,The Daily Star, August 8, 200)1. The main suspected sources of agricultural runoff pollution are from the use of fertilizers and agrochemicals, including herbicides and pesticides. Urea, Triple Super Phosphate (TSP), Muriate of Potash (MP) and Gypsum are the major chemical fertilizers used in Bangladesh. The total amount of Fertilizers used annually are about 2 million tons. With the increase of irrigated areas and cultivation Of HYV rice, there was an increase of about 20 per cent fertilizer use in 1990. But the present growth In use has decreased and fluctuates from plus minus 5 to 10 per cent. In 1995, the use of nitrogenous fertilizer accounted for about 88 per cent of the total fertilizer use, which was about 67 per cent in 1991. The share of the market held by domestic production of Urea, TSP and Gypsum is currently about 90 per cent (BBS, 1979, 1985, 1990, 1994, 1998). The safe disposal of solid wastes or byproducts from fertiliser plants has been problem particularly in developed industrial countries. Phosphogypsum is by far the largest byproduct in the manufacture of "wet-phosphoric" acid. For every ton of P205 produced, 5 tons of phosphogypsum must be disposed of... Another solid waste is produced in Vetrocoke (potassium carbonate) processes for eliminating carbon dioxide in the manufacture of ammonia. The sludge contains 20% arsentrioxide As203. At Ghorasal fertilizer factory in Bangladesh a large amount of arsenic trioxide deposited for use or disposal to unknown destination! Several studies have shown that heavy metals are present in the parts per million (mg/kg) range, and occasionally as high as parts per thousand, in fertilisers produced from recycled industrial by-products (US EPA, 1997). About 30% of the fertilizers in Bangladesh is lost through drainage. The amount of triple superphosphate currently used in agriculture equals to 1, 00, 000 tons of P. The pollution of surface water bodies from P-fertilizers may assume significance in some places loke the open water bodies near the residence of the farmers or in the depressions/basins area, IUCN, 1992 (highest arsenic contamination occurs here). All along borders of Bangladesh very low quality of fertilisers are imported illegally by dishonest traders. The heavy metal or other toxic materials have not been analysed by any one.Reports available from Chowgachha border said, five border points of Chowgachha area including Borni, Mashila, Shahjadpur, Hizli and Andulia are virtually open for the smugglers. Hundreds of bags of Indian Single Super Phosphate (SSP) are entering into the country daily. The granules of this Indian fertiliser are almost similar to Bangladeshi Triple Super Phosphate (TSP). The dishonest fertiliser traders of the border areas are alleged to have been selling the Indian SSP to the ignorant and innocent farmers as Bangladeshi TSP and cheating them outright. (The Independent, 22.09. 03). It may be mentioned here that there is a gulf of difference between the quality of the Indian SSP and Bangladeshi TSP. As a result, prices of these two fertilisers are also different. A bag of TSP is sold between Tk 610 and Tk 680 whereas the price of the inferior quality Indian SSP is between Tk 260 and Tk 270 per bag. By using the Indian SSP in their land the farmers of the border areas are being unable to fulfil the target of production of crops. The fertility of their land is also at stake. The dishonest fertiliser traders still market the smuggled Indian SSP without caring for the interest of country. Farmers of Bangladesh are using pesticides since 1957 and at present on an average of 12-15 thousand tons of pesticides are used every year. Insecticide accounts for about 90 per cent of the total consumed pesticide, and is used most for cultivating vegetables and Rabi crops (BBS, 1984 and 1998). Although pesticides are used at low levels still they are a cause of land degradation. The pesticides sprayed over standing crops ultimately contaminate the surrounding soil. Research findings show that pesticides applied at the rate of about one kilogram per hectare contaminates the topsoil to a depth of about 30 cm. The pesticides not only destroy harmful insects, but also destroy useful topsoil microbes, which eventually reduce the biological nutrient replenishment of the soil. The British Geological survey and others came to Bangladesh very promptly and as the purpose of their visit served, left Bangladesh quickly. They could have done a great work, if they had surveyed Holocene geology of Bangladesh, analysed agrochemicals and showed us many shallow closed aquifers that are arsenic free. Bangladesh Agricultural Departments should carefully investigate hazardous materials in fertilizers and pesticides before they import or distribute to farmers. Unfortunately, at present a large segment of the rural populace do not have access to public water supply facilities. The water sector has under-performed in Bangladesh until now. Quantities of water delivered are inadequate and service is unreliable, requiring consumers to make alternate arrangements, which are costly in terms of time and money. Soil pollution by heavy metals and pesticides residues through the application of chemical fertilisers, pesticides. The main sources of soil pollution by heavy metals are phosphate fertilisers. On many of our agricultural soils we have now been applying heavy doses of phosphatic fertilisers for over 50 years, and all of these heavy metals keep accumulating, and the amounts of present are becoming more and more toxic. Our soil contains millions of elements, compounds, and species of biolife. Most of these are necessary, but only in minute quantity. In natural ecosystem and traditional agriculture, the very delicatebalance between the different elements is usually maintained, but input-oriented, industrial agriculture the equilibrium is rudely disturbed through the infusion of very large amounts of certain elements contained in agrochemicals.